Hellraiser: The Toll tells the story of what happened between Clive Barker's iconic works Hellraiser and its literary follow-up, The Scarlet Gospels. Written by Mark Alan Miller (Next Testament, The Steam Man), featuring narration by director Tom Holland (Child's Play, Fright Night); a full cast that includes Mali Elfman, Kasey Lansdale, Peter Atkins, Robert Parigi, Richard Ankles, Christian Francis, Joshua Holland, and Justin Vonderach; and original music by powerhouse composer Cris Velasco (God of War 1-3, Clive Barker's Jericho). 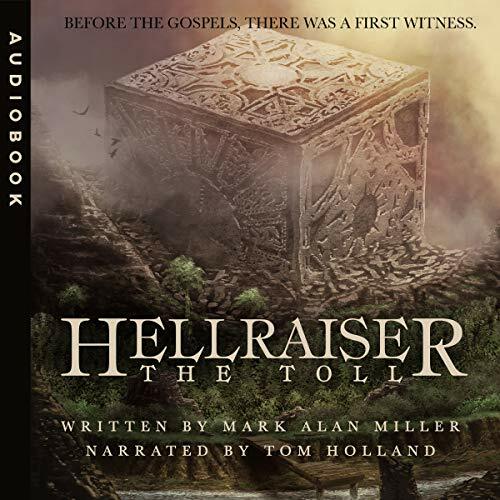 With equal parts economy and eloquence, author Mark Alan Miller brings to life the beginning of the end as The Toll expands the Hellraiser universe and shows that before Detective Harry D'Amour's adventures in The Scarlet Gospels, there was a first witness to Pinhead's infernal plan. too short, the story ends right when you expect the story begins. seems like a prequel tease to the real story. writing and atmosphere is great and on par with the mythos of the movies, just feel scheated in the amount of content, this would be fine In a book of short stories, but not a stand alone novel. The story itself was just okay, but I couldn't stand the performances. I love Tom Holland, but he sounded so bored. If you loved the Hellbound Heart novella, but were underwhelmed by the Scarlet Gospels, you might be looking optimistically at this addition to Cenobite lore with the hope that it may be the satisfying sequel that you've been eternally aching for. But like Frank Cotton fumbling at the invisible crevaces of Lamarchand's box in search of unfathomable pleasures... you were sorely mistaken. Firstly, this is NOT a sequel to the Hellbound Heart, it is a sequel to the movie Hellraiser. Clive Barker makes this decision in his own Scarlet Gospels, but in his case it feels very much like a humourously sardonic "Dear John" to the Hollywood distortion of his most famous creation. The Toll has no such subtext, and takes no joy in defaming the character, instead delivering awkward and occasionally cringeworthy references to the movie. Now the story has a wealth of interesting ideas, but fails to knit them together and there is never anything resembling a payoff. The events come and go, teasing you with the prospect of new insights and new developments, but these fail to materialise. Some of the voice acting is fun, but as much as I am a fan of the legendary Tom Holland, his delivery is that of a jaded old detective unemotively reading the summary off the back of a novel. It is mercifully short and it shows glimpses of promise, but it is less than poor fan-fiction when put in the context of Barker's genius. Read in such a dull monotone fashion that I just couldn’t stick with it. Don’t buy. I came across this book whilst searching for Hellraiser comics. The price of the book seemed really expensive so when I found it on Audible I immediately downloaded it. How disappointing. The narrator was good, the other readers were good too but the story is dire. For a Hellraiser novella it just doesn’t go anywhere. I felt very much short changed after this. It should have been much better.